Blackbeans Jumble, our Monday night one-pot dinner creation influenced by Creole Jambalaya. 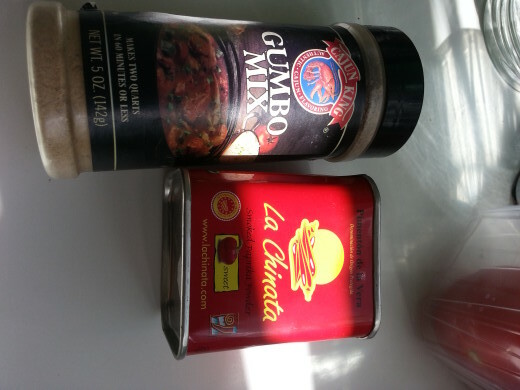 The origin of Jambalaya apparently derives from the Provencal which is spoken in the South of France, the word “jambalaia” refers to a mishmash or mix-up. Talking about fusion, diversity and cooking, you definitely will find it in Creole cooking, this cuisine is a living proof of all the descendants of early settlers. 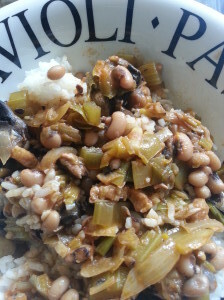 Louisiana Creole cuisine is recognized as a unique style of cooking, which makes use of the “Holy Trinity” (in this case, chopped celery, bell peppers, and onions), but has a great variety of European, French, Caribbean, African, and American influences. I love one-pot dishes, mixing ingredients and blending of spices they are ideal to finish up whatever vegetable is leftover on my kitchen counter. Adding pulses and legumes to your diet is very healthy since beans are considered protein-rich super food. Beans are low-glycemic, high-fiber, high-protein and packed with important vitamins, minerals and antioxidants. Not to mention very convenient to cook and to add to your weekly meal plan. Beans help you feel fuller for a longer period of time and as a bonus helps to lower your weight. Double value for health and grocery shopping budget to buy dried beans instead of cans or jars, a bag of beans is very economic, because it triples in quantity. One dried cup yields 2½­- 3½­ cups soaked beans, enough to feed a family of 4-6 persons. 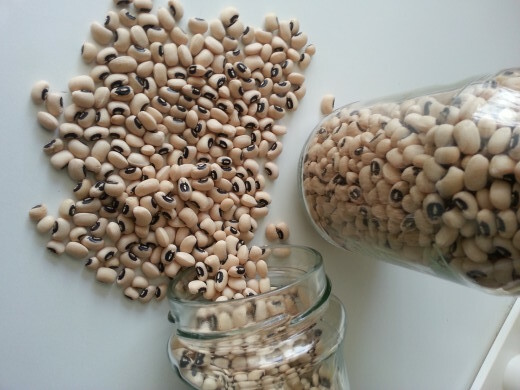 Just soak a cup overnight (1-2 days max, refreshing water in between) to let them well double in size, transfer to a pressure cooker and depending the bean and quantity you only have to cook 7-10 min tops and the beans are ready to be used in dishes or as ingredient of a recipe. For an overview of beans with image and description click here. Pre-soak overnight up to 24 hour, rinse in between (48 hours max otherwise it will ferment instead!) is a must and cook them well, the beans must be entirely soft without any hard bits. Add a knife tip – pinch of baking soda to the soak water of dried beans before cooking, this will significantly decreases the content of the raffinose family of sugars. From our time in India, were lentils are staple food we learned from Indian cooking to add asfoetida aka ‘hing’ as a digestive aid, this little tub is on our spice rack among Indian spices. In many Indian recipes it includes turmeric and ginger both are digestives spices as well. Other spices are cloves, cinnamon, and garlic are potent in reducing gas. Chili con Carne is a well known recipe with kidney or brown beans, Blackbeans Jumble is made with blackeyed beans and this recipe has creole influences but was mainly inspired by leftover greens, the use of spices like smoked paprika powder and cumin makes it interesting. You can add peppers if you like the heat or leave them out, by omitting the meat it will become a full vegan dish. 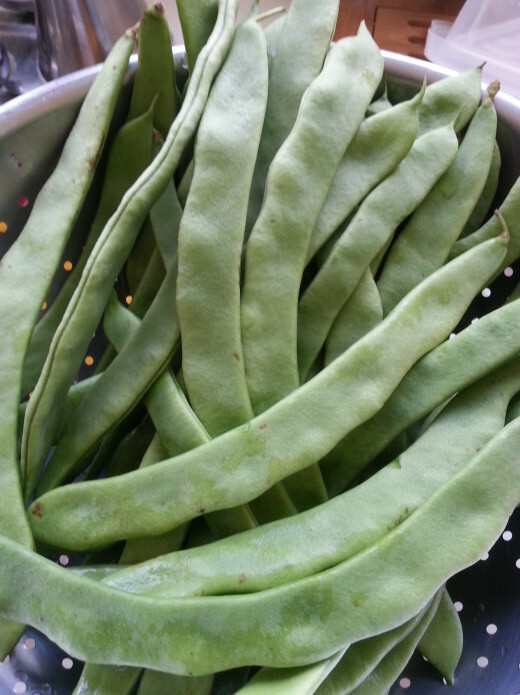 Flat beans are in season now for € 0,99 p/kg, fresh bright green, smooth skin, crunchy and string less, flat beans belong to the same group as runner beans. 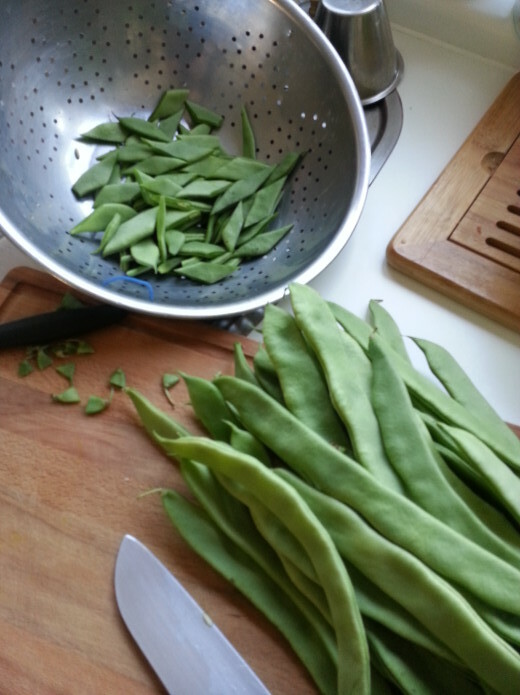 Flat beans here in The Netherlands/Europe are cooked, boiled or steamed, although I do not know many cooks who will use this unless they have a steamer appliance or steamer-oven otherwise too much hassle. 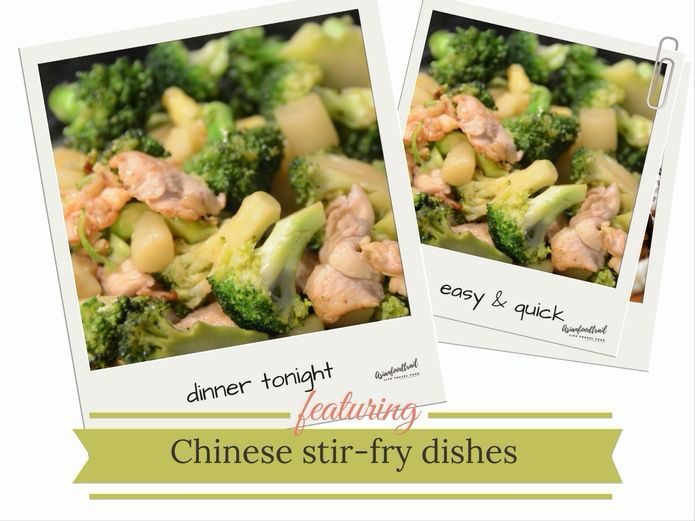 My favorite way of cooking is stir-frying, the cutting up takes more time than cooking in a wok or saute pan/flatware. 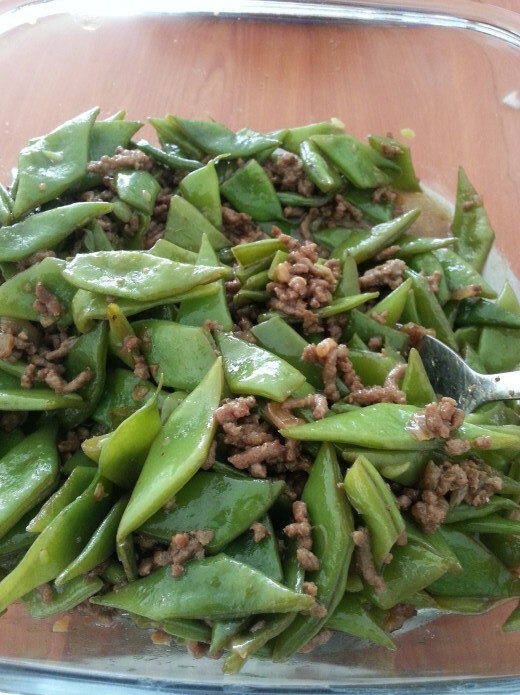 Day before I had prepared fresh aubergines with SiChuan chilibean paste and I only needed half a package of ground pork meat, so I had some leftover ground meat to be used. When I refer to soybean paste, I realized it can be confusing especially since I have 4 kinds of bean sauce. 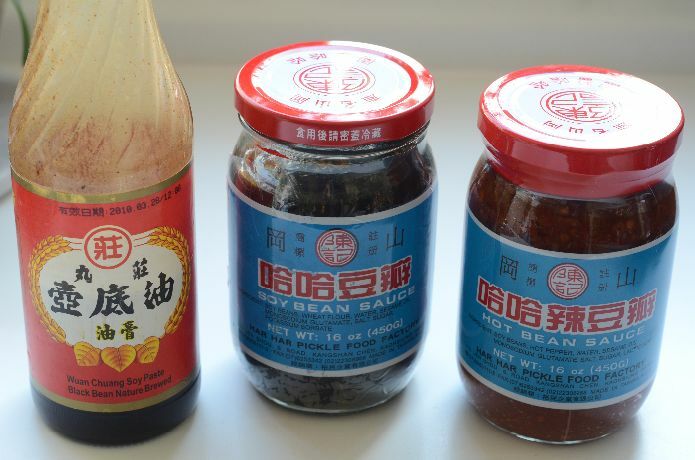 Three as shown in the picture above; the first one is a Taiwanese brand, the two glass jars Chinese and the fourth one missing is a Thai version (a photo will appear in another dish soon). 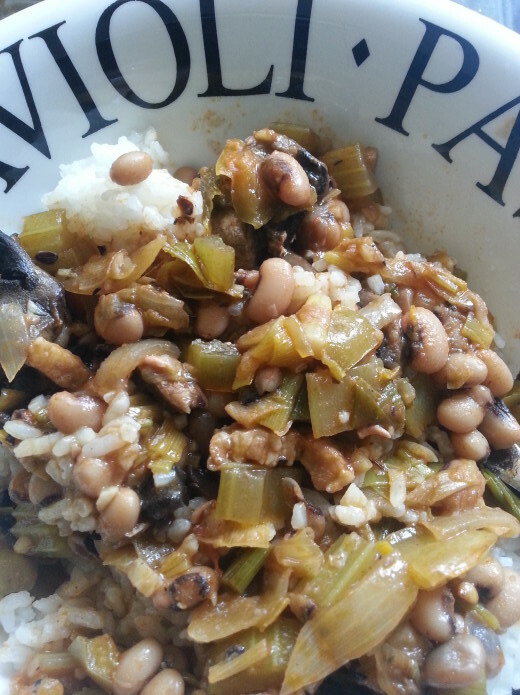 Now for tonight’s dinner I only used bean sauce, the middle jar but if I would be cooking with chicken or dou fu I would mix bean and hot bean sauce together for an even stronger flavor. To speed up cooking even more, you could zap the bean in the microwave for 5-7min (depending microwave power), we like a crunchier texture so never pass beyond 7 min otherwise even stir-frying will make them wilt even more. 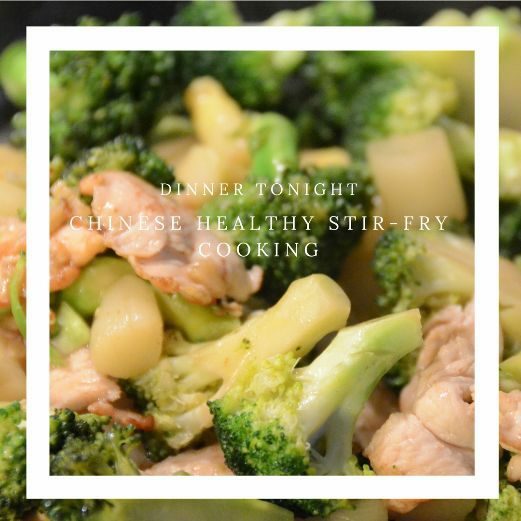 With cutting up the vegetables, cooking the rice (2-3pers) and stir-frying this dish dinner is served with 15- 20 minutes tops. 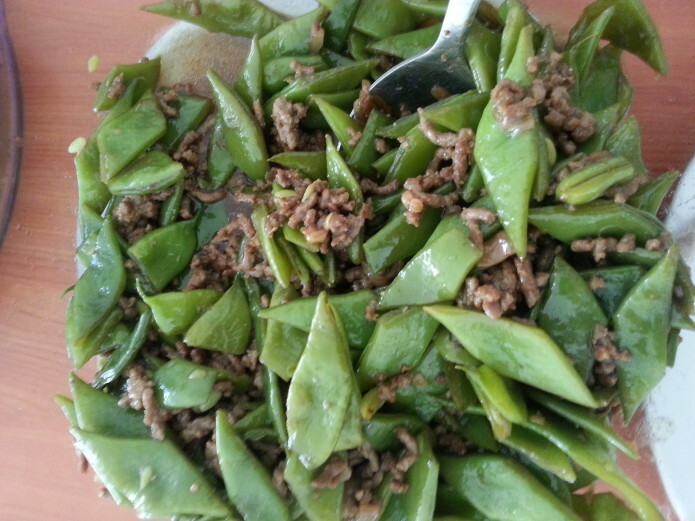 You can substitute flat beans for runner beans and make this a vegetarian dish by omitting ground meat, variation are endless. You can even create a spicier version by mixing both the bean and hot bean sauce or adding a chili paste to enhance spiciness and leave out the bean sauce entirely. This recipe gives you a base to mix and match and experiment further to create your dish.